Hypermobility syndromes are complex conditions and often combined with multi systemic symptoms. Mis-diagnosis of the condition is a very common occurrence, partly due to patients symptoms not always presenting themselves in medical tests, and because the condition is very poorly understood by the medical profession. Therefore access to treatments is limited, which has a negative impact on patient’s quality of life. 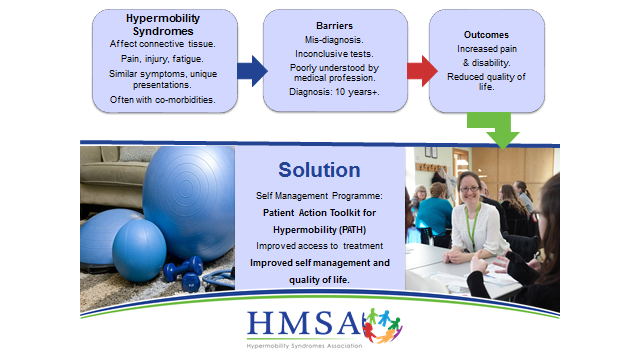 To overcome these issues the Hypermobility Syndromes Association (HMSA) is proposing to develop and deliver a two year innovative Patient Self Management Programme called PATH, ‘Patients Action Toolkit for Hypermobility’. This is a collaborative programme which will involve patients, professionals and providers. The eight week programme will be patient-driven and based on a pain management programme model. Evidence suggests that pain management programmes work better if they are ‘condition’-specific, and not general, in the approach to pain. Therefore, the innovation for this project will be realised by the treatments specific to hypermobility syndrome patient needs, and also by the HMSA continuing to provide ongoing support to those who attend the programme once the programme is finished. By providing patients with access to treatment, which is tailored to their needs and enabling them to take ownership of managing their condition, it is envisaged that longer term and sustained benefits will be achieved. The expected programme outcomes are underpinned by improving quality of life for individual patients, along with supporting wider programme outcomes. These are focussed on reducing the need for patients to access the National Health Service, and reducing the need to apply for welfare benefits, as patient’s ability to participate in everyday life improves, increasing the ability of patient being able to participate in education or training and access employment.